LAS VEGAS, NV (October 20, 2014) -- Former two-division world champion TIMOTHY "Desert Storm" BRADLEY JR. returns to the ring where he will battle one-time interim welterweight world champion DIEGO "La Joya" CHAVES in a 12-round welterweight rumble, Saturday, December 13, inside The Chelsea at The Cosmopolitan of Las Vegas (3708 Las Vegas Blvd South, Las Vegas, NV 89109). The fight will be televised live on HBO World Championship Boxing®, beginning at 10:00 p.m. EST/PST. The telecast will open with World Boxing Association (WBA) Interim Super Lightweight World Champion MAURICIO "El Maestro" HERRERA defending his title against undefeated contender JOSE BENAVIDEZ, JR. These four gladiators boast a combined record of 96-7 (53 KOs) -- a winning ratio of 93% with over half of those victories coming by way knockout. "I'm excited to get back into the ring and showcase myself," Bradley told ESPN.com. "Chaves is not that well known but the boxing fans know him. The boxing fans know that this guy can fight and that it won't be a walk in the park for me. I think it's going to be a great fight. I can't wait." "I give Timothy Bradley all the credit in the world for coming back after his first loss to face me, especially after seeing how I hurt Brandon Rios in my last fight," said Chaves. "We both have a lot to prove on December 13. If Bradley thought he had it rough against Ruslan Provodnikov, wait until he collides with me." "I'm so happy that this fight was made and I get to showcase my skills once again on a huge stage," said Herrera. "I'm coming off of one of the most important wins of my career and I plan on using that momentum to defend my title and convincingly defeat Benavidez on December 13." "I'm obviously excited and grateful for the opportunity to fight for the title. It's something I've worked for since I was a kid," said Benavidez. "I know I'll be bringing the title back to Phoenix with me. I have heard Herrera is looking past me and talking about moving up in weight when he wins, and I'm sorry that I'll be disrupting those plans on December 13th." "Tim Bradley's return to the ring may be taking place at the end of the year but it's the beginning of a new and exciting phase of the boxing career of one of the sport's elite fighters, a man who has held a world title every year dating back to 2008," said Todd duBoef, president of Top Rank. "Diego Chaves came so close when he faced Brandon Rios in his last fight and I anticipate seeing that same intensity and aggressiveness when he faces Tim. This will be a war. The Cosmopolitan of Las Vegas will once again be hosting boxing at the highest level on December 13 and the world will be able to watch it on HBO." "So much hangs in the balance for both of these fighters - Herrera's WBA Super Lightweight World Title, Benavidez' undefeated record and much more," said Golden Boy Founder and President Oscar De La Hoya. "With Herrera's straight-ahead style against Benavidez' Olympic pedigree, we have all the makings of a fantastic fight for fans." "There is no better way to present boxing fans with a pre-holiday gift than to feature the return of Timothy Bradley Jr. headlining an attractive card on World Championship Boxing, Live on HBO," said Peter Nelson, Vice President of Programming, HBO Sports. "Bradley squares off against Diego Chaves, whose in-your-face style of fighting will keep Tim on his toes the entire night. And we anticipate fireworks from the rest of the telecast action." Bradley (31-1, 12 KOs), from Palm Springs, Calif., a former two-division world champion who unified the junior welterweight titles twice during his previous four-year reign, returns to the ring after suffering his first professional loss, in his welterweight championship rematch against Fighter of the Decade Manny Pacquiao last April. Before the Pacquiao rematch, Bradley posted three consecutive career-best victories. After moving up in weight and beating Pacquiao in 2012 to capture the World Boxing Organization (WBO) welterweight crown, Bradley co-starred in the Fight of the Year on March16, 2013, winning a brutal 12-round decision over future world champion Ruslan Provodnikov though Bradley was suffering from a concussion throughout most of the fight. In his most recent fight, on October 12, 2013, Bradley gave a virtuoso performance in defeating three-division world champion and Mexican icon Juan Manuel Márquez proving that Bradley is indeed one of boxing's elite pound for pound fighters. Chaves (23-2, 19 KOs), from Buenos Aires, is a power puncher who stalks his opponent with only one goal -- THE KNOCKOUT! His victory by knockout ratio of 83% proves it is usually "mission accomplished" for him. Chaves made his Las Vegas debut on August 2 when he fought former world champion Brandon Rios at The Cosmopolitan. The fight was all blood and guts as both warriors tore into each other in a foul-filled bout that ended in the ninth round with Chaves being disqualified by referee Vic Drakulich. At the time of the stoppage, Chaves was ahead by one point on one scorecard and down one point on the other two cards. 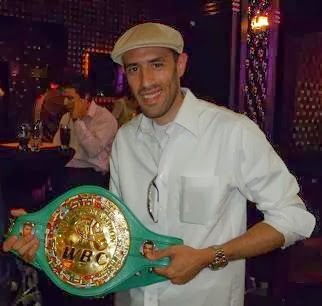 Chaves captured the WBA interim welterweight title in 2012, knocking out defending champion Ismael El Massoudi in the second round. Chaves' one-year title reign included a successful title defense against José Miranda, where he scored another second-round stoppage. He lost the title to Keith Thurman July 23, 2013. Chaves began 2014 with a third-round TKO of Juan Godoy on February 15. He is currently world-rated No. 7 by the WBA and No. 10 by the International Boxing Federation (IBF). Herrera (21-4, 7 KOs), from Riverside, Calif. and promoted by Oscar De La Hoya's Golden Boy Promotions, will be making the first defense of his interim world title. He won the championship in his last fight, on July 12, dethroning Johan Perez via a majority decision in a fight that was as close as it was competitive. It was a victory made sweeter by the fact Herrera had lost his previous title shot, against undefeated unified super lightweight world champion Danny Garcia on March 15, via a controversial majority decision that many thought Herrera had won. Herrera's professional resume includes impressive victories over former WBO Junior Welterweight World Champion Ruslan Provodnikov and former amateur standout Mike Dallas, who had a combined record of 34-1-1 when he faced them. Benavidez (21-0, 15 KOs), from Phoenix, AZ, was a sensational amateur prospect, winning a Gold Medal at the 2009 National Golden Gloves Championships at the age of 16, the youngest fighter to ever win the National Golden Gloves Championships. He turned professional one year later, at age 17, where he became the youngest professional boxer to be licensed by the Nevada State Athletic Commission. He was granted an exception (the minimum age requirement was 18) because of his exceptional talent. After spending most of 2013 sidelined with a broken hand he has come back to win all three of his 2014 fights decisively, including a first-round TKO of Henry Auraad on July 26.